You love your new vacuum food sealer. How did you ever live without it? There have been so many ways that it has made your life easier. Meals have become easy to fix. 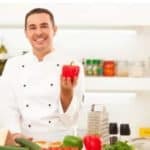 You have been able to store leftovers, bulk foods, fruits, and vegetables. Unfortunately, your sealing frenzy has left you with no bags. You have used every bag that came with your new sealer. Where do you find replacement bags? How do you know that they are good quality? Let me help you with a Guide and Review of the Vacuum Sealer Bags. As the name implies Vac-Fresh bags come in a roll. The 50 foot roll allows for custom lengths to fit your needs. Their 11 inch width makes them a universal fit. Vac-Fresh bags feature cross venting channels. They allow the user to extract the maximum amount of air while sealing. The bags are thicker than most with a 3.5 mil thickness. The extra thickness means they offer the ultimate protection for your freezing needs. The added thickness may cause problems for some vacuum sealers. Look at manufacturer’s thickness recommendations before purchasing. Silver and jewelry can be stored in Vac-Fresh bags. The bags will prevent your valuables from tarnishing. 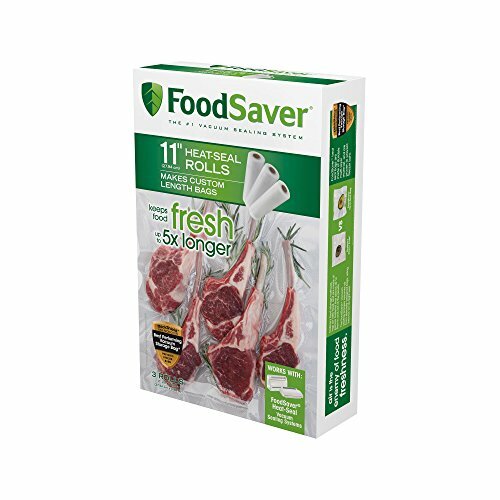 FoodSaver bags are designed to work exclusively with FoodSaver vacuum sealer units. No length figures are available. There are three rolls in a package. There’s no way to discern the total footage. FoodSaver bags are available in either an 8” or 11” width. Bag thickness is also missing from the packaging. The bags are multi-ply so at least a 3 mil thickness should be assumed. They are good for multiple uses. FoodSaver bags can be used with other units. Weston bags are the only conventional pre-sized bag in our review. That fact really limits the utility of this item. However, Weston sealer bags are available in three different sizes. There is the choice of a smaller 6” x 10” and a larger 11” x 16” bag. 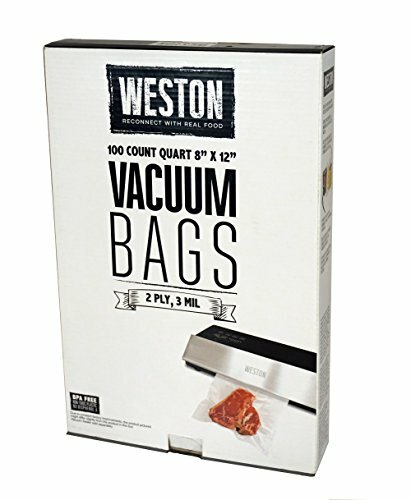 With 100 bags per container, Weston bags are the best value in the review for the price. They are a 3 mil, 2 ply design. The bags seal consistently, unlike some others in our review. Weston bags can be used with Weston sealers. They can also be used with external-clamp vacuum sealers. Fishermen found Weston bags especially useful. The smaller bag size made it easier for them to package filets. 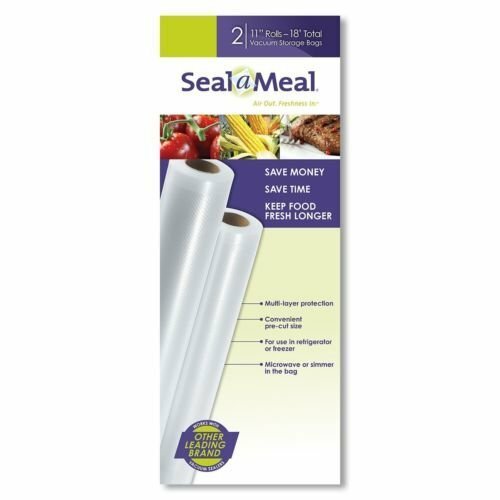 Seal-A-Meal is one of the most recognizable names in vacuum food sealing. Small size rolls (only 9 feet) designate this more for occasional use than some other reviewed sealer bags. Each package contains 2 rolls. As with the FoodSaver bags there is no information regarding bag thickness. Nor is there any mention of the number of layers (plys) each bag is constructed with. The final review is another FoodSaver product. This product differs from all others reviewed so far. The bags are individual and not a roll. The biggest difference from the other reviewed bags is the zipper lock system. The zipper allows these FoodSaver bags to be used as more than just a vacuum freezer bag. Although the bags have a zipper they can still be vacuum sealed. This bag is designed for a hand-held vacuum sealer and not the larger units.
. The bag is multi-ply constructed. Each bag is capable of holding a gallon for storage. No dimensions are available. 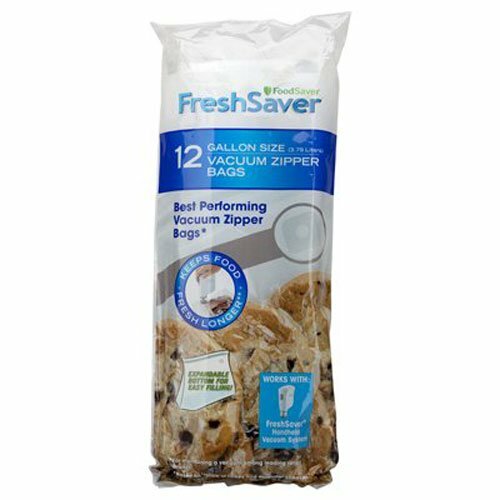 FoodSaver zipper bags are more versatile than the other reviewed products here. They can be used in the same manner as a zippered plastic bag. One drawback of this product is the lack of more than a single use per unit. 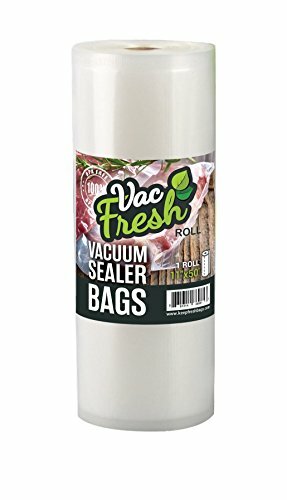 Reviews for the FoodSaver gallon-sized vacuum zipper bags are mixed. Some consumers praise the bag’s versatility. Other consumers noted trouble creating a permanent seal when frozen. High cost when compared with any of our other reviewed vacuum bags. Do they fit my machine? Every vacuum sealer manufacturer makes their own replacement bags. In addition generic replacement bags are available. If you aren’t happy with the bags that came with your sealer you have options. The most important consideration is size. Most vacuum sealers for food have a 12 inch sealing width. The great majority of replacement bags available come in 12 inch width or less. Always double-check the width before purchasing replacement bags. You want them to fit your particular vacuum sealer. If you have a hand-held vacuum sealer look closely for compatibility with your unit. Bag sealability and thickness are the important issues here. Again, check for compatibility with your machine. Some bags might not work as well with your sealer. Bag thickness can play a huge role in the quality of food stored. A thinner bag won’t be as durable. It may also puncture during the vacuuming process. A multi-ply bag that’s 3 mil or thicker will stand up to use in a freezer. When shopping look for “heavy duty” bags. Some of the less expensive brands may not seal as well as higher quality bags. Can they be cut to different lengths? Almost all replacement bags can be cut to any length you desire. Depending on price replacement bag rolls come as long as 50ft. A few brands come in pre-sized, single bags. Those bags normally come in an 8” x 12” size. Zipper bags are also used for vacuum storage. They come only in separate units. Not all vacuum bags are reusable. Again, it’s a question of bag quality. A thicker bag can be washed, dried, and reused. Zipper-style bags are especially long-lasting. Look for bags with cross-channel or texturing. Those features are designed to maximize air removal during sealing. Some replacement rolls may not fit into your sealer’s internal storage. It is possible to use bag rolls that are larger than the storage compartment. Make sure the bags are BPA-free and FDA listed as safe for food storage. Each of the reviewed bags has it’s strengths and weaknesses. A 50 foot roll gives the Vac-Fresh an advantage for vacuum freezing large quantities or large items. The Vac-Fresh is also the thickest bag at 3.5 mil. The FoodSaver 11” roll rates high for use with multiple vacuum sealers. High consumer ratings speak of high quality. Weston’s 8” x 12” 100 count bags offer the greatest value for cost per bag. They were rated highest alongside the FoodSaver 11” bags. Neither the Seal-A-Meal nor the FoodSaver Gallon sized bags is in the class of any of the aforementioned products. If purchasing a vacuum sealer and replacement bags for my own use I would go with Vac-Fresh bags. Their bag thickness, 50 foot roll, and relatively low cost come out ahead of the other reviewed products. I tried out the ones that are pre-cut, but found them to be kind of annoying. I’d definitely recommend your readers stick with the roll variety of bags.